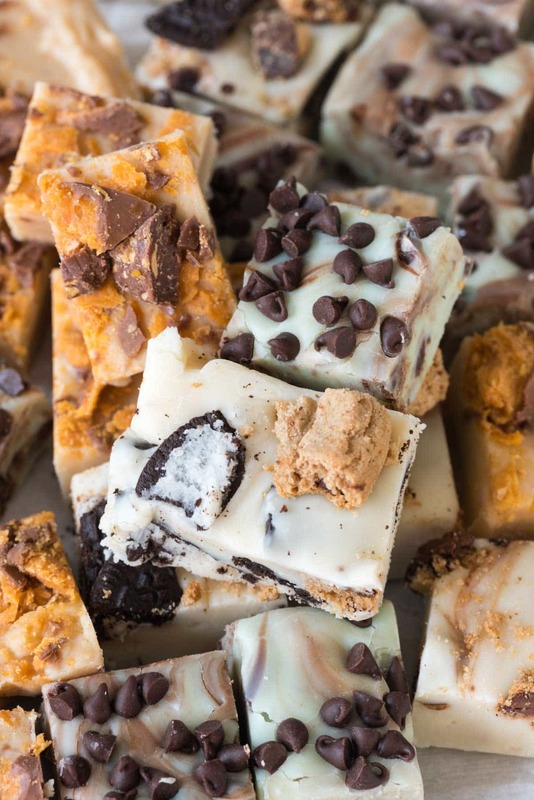 5 Minute White Chocolate Fudge made 3 ways: peanut butter fudge, mint chip fudge, and Cookies & Milk Fudge. Four main ingredients make this easy fudge recipe, with infinite fudge recipe possibilities! Want to know a dirty little secret? I’m not a huge fudge lover. You’d think I would be, since I love sugar and chocolate and all the things IN fudge…but it’s not something I’d reach for if given a choice. (Although I’ve been known to spend $50 on gourmet triple layer fudge at specialty shops on vacation…ahem.) However, several people I know LOVE fudge, and it seems the internet does too, so I make it quite often this time of year. There are so many recipes for fudge out there: cooked or not cooked, microwaved, marshmallow fluff, sweetened condensed milk, frosting, chocolate chips, candy thermometers…the options for recipes go on and on. And while I’ll admit that those complicated cooked recipes that require a candy thermometer and the hand of God taste amazing, they NEVER work out for me. Last year I tried making peanut butter fudge from a reputable recipe three times and it failed every time. I know it was user error; I had to be doing something wrong because the recipe was fine, from a good source. Cooked fudge and me just don’t mix. Does anyone else have that problem? Yes? Good, then THIS 5 minute white chocolate fudge recipe is for you. It’s EASY fudge, with just 4 main ingredients. It can be made on the stove or in the microwave. Alone it tastes good but if you add a few other simple ingredients you can easily transform it into a brand new recipe. Make it peanut butter or full of candy, make it mint or coconut or full of cookies. 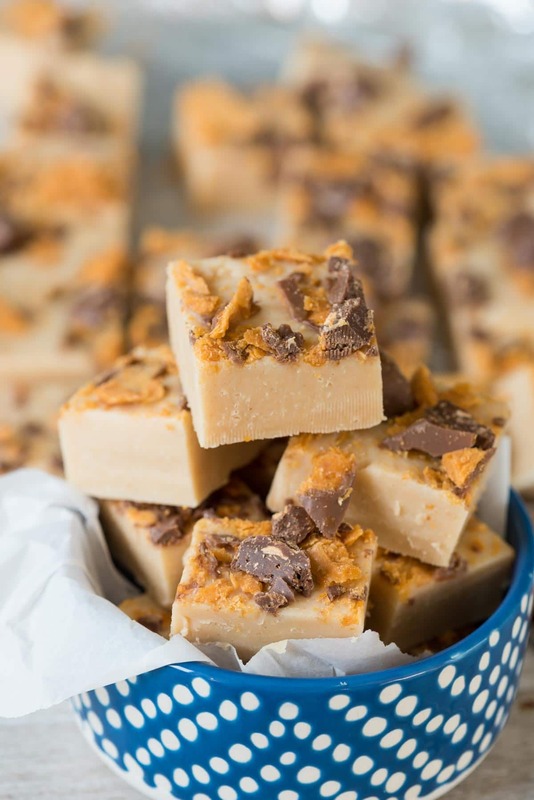 The sky is the limit once you have this fudge recipe! The basic recipe consists of white chocolate chips, sweetened condensed milk (SCM), vanilla, and a pinch of salt. It’s the basic recipe from the back of the SCM can. I’ve made this on the stove and in the microwave and I gotta say, I like the microwave method better. It’s faster and somehow easier. You just add your white chocolate and SCM to a large bowl and melt it for about 2 minutes, stirring occasionally, until it’s melted and thick. Then you add your extract and a pinch of salt and pour it into the pan. The hardest thing is letting it set before you eat it! The easiest thing to add to transform this easy recipe is to add candy…or cookies. I like to add Oreos and chocolate chip cookies, but you can use any kind you like. Clean out that pantry and empty those last few cookies from the bottom of the box. You could add cereal or caramel corn, any kind of candy or toffee or nuts. The sky is the limit! 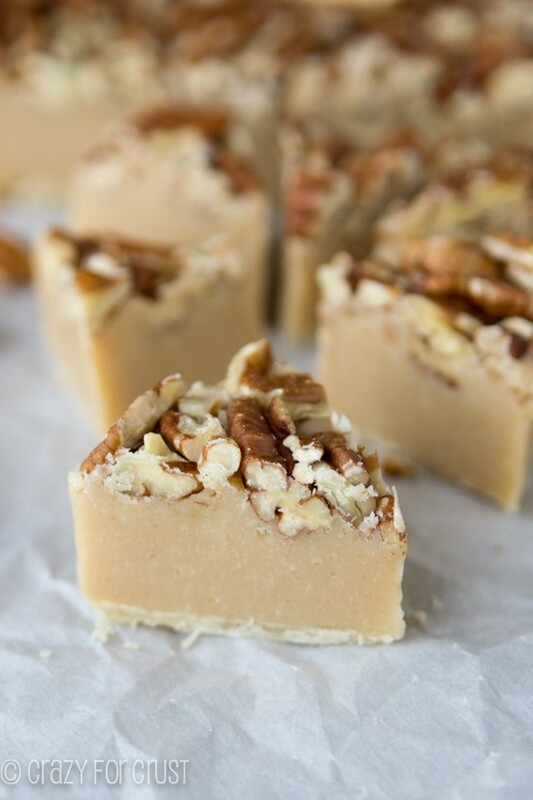 My favorite way to doctor up this 5 minute white chocolate fudge recipe is probably with peanut butter because, well, duh. When you turn the 5 minute white chocolate fudge into peanut butter fudge, you add the peanut butter with the white chocolate and sweetened condensed milk before melting. When you’re stirring it all together it’s going to seem like it’s seizing up, but just put it in the pan and it’ll harden up just fine. You can leave it plain peanut butter or add chopped candy or nuts, or even drizzle melted chocolate on top. And then there is the kind that Jordan loves: mint chip! 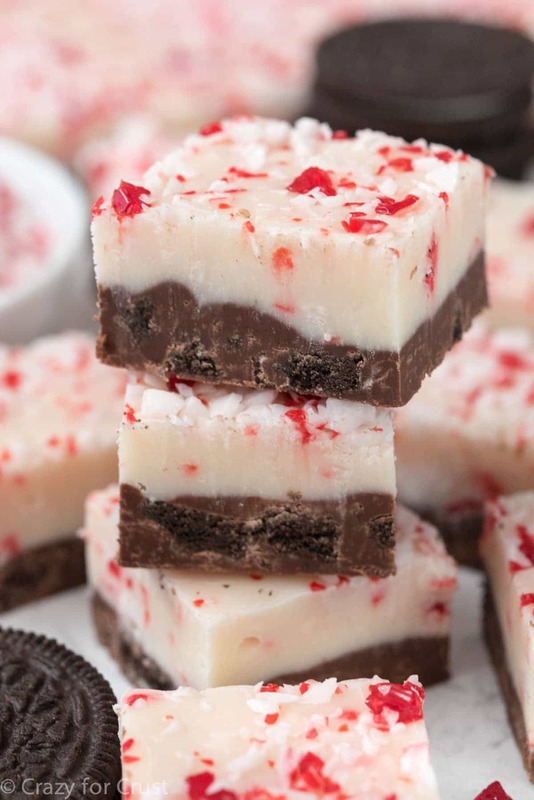 To make the mint chip fudge, I add peppermint extract in addition to the vanilla extract. Peppermint vs. mint extract is really a personal choice (I hate mint extract but I love peppermint). I added a few drops of green food coloring and then stirred in some mini chocolate chips. They melted in a little, creating a swirl effect, before I could get it into the pan. If you want to avoid the swirl, use regular chocolate chips and work very quickly. Mint isn’t the only way you could doctor this fudge: make it lemon or coconut or any flavor using ANY flavor extract, then stir in some mix-in that matches, like toasted coconut. 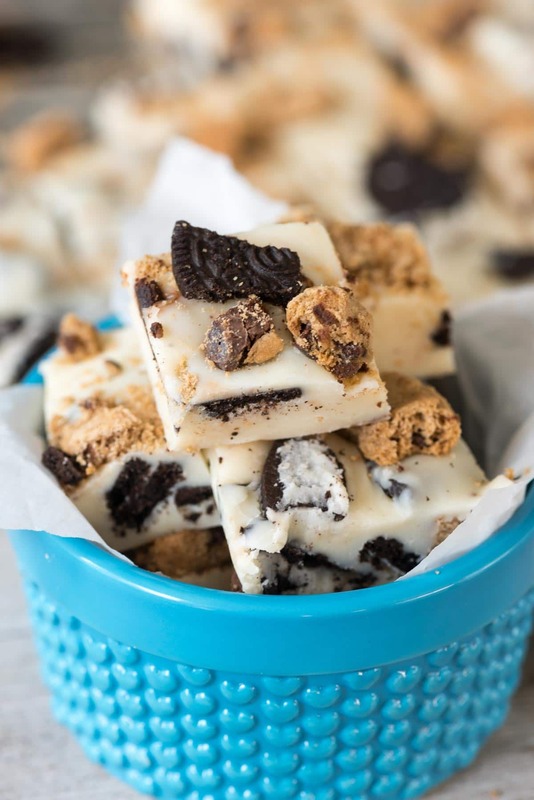 EASY 5 Minute White Chocolate Fudge made 3 ways: peanut butter fudge, mint chip fudge, and Cookies & Milk Fudge. 4 Ingredients, infinite fudge recipes! Line a 9x9" or 8x8" pan with foil and spray with nonstick cooking spray. Place white chocolate chips and sweetened condensed milk in a large microwave safe bowl. Heat for 1 minute on high power; stir. Heat an additional 30 seconds, stirring after, and continuing until mixture is just melted together and smooth. Stir in vanilla and salt, then spread in prepared pan. Chill to set (sometimes it'll set on the counter, but it'll take longer and depend on the how warm your house is). Slice into 1" squares. Store in an airtight container in the refrigerator for up to 2 weeks. Cookies & Milk Fudge: add 1 cup each chopped Oreos and chocolate chips cookies (or 2 cups of your favorite cookie) in step 3. Sprinkle additional cookies on top for garnish, if desired. Peanut Butter Fudge: add 1/2 cup peanut butter to the chips and sweetened condensed milk in step 2 (before heating). Melt as directed. The mixture will look a little bit seized after melting, but that's okay. Spread it in pan as directed. If desired, add 1 cup of chopped candy in step 3. 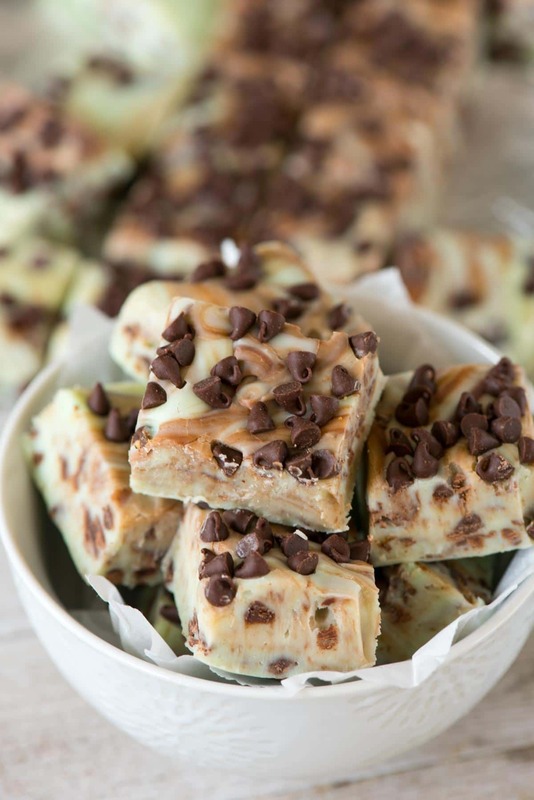 Mint Chip Fudge: add 2 teaspoons peppermint extract and 2-3 drops of green food coloring in step 3, then stir in 1 cup mini or regular sized chocolate chips. Spread in pan as directed. 5 minutes??? That’s such great news! I adore you for sharing this. That’s it, you’re my best friend! I’m the same way – those stovetop/candy thermometer ones scare me because I always encounter user error. Love this super easy and customizeable fudge! This looks fab and love the variations. I’m not a huge fudge lover either. 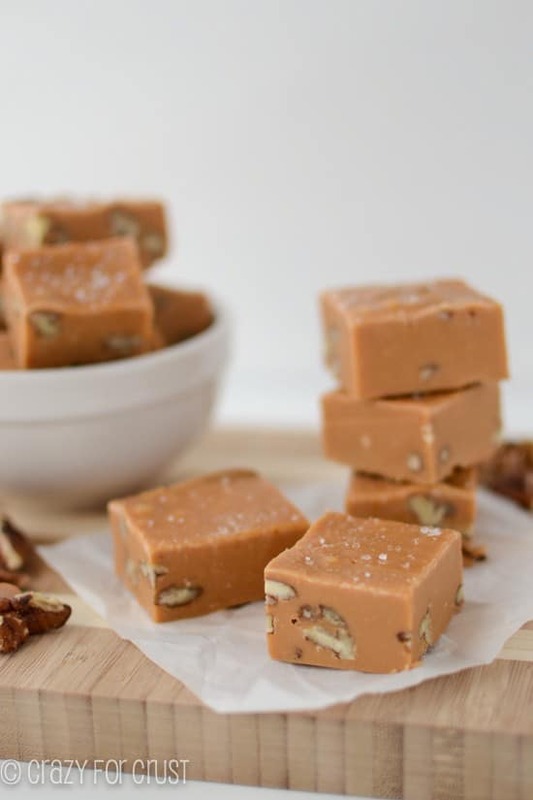 Funny, the last recipe for this holiday season I made was PB fudge (not a cooked version, no time for that monkey business right now) but I’m not posting it til Jan bc my Dec is already full 🙁 lol It can be a Valentine’s thing too, right? I believe I have fallen in love with your site and your insightfulness. Thank you for looking fear straight in the eye and sharing with all of us. I’ve never been a big fudge fan either unless it’s full of nuts (or something to take away the denseness of the fudge). Never thought of adding cookies…YUM! So many yummy combinations to try! Love this! I like easy fudge recipes that don’t require boiling and thermometers! They never work for me either! Love all the fun mix in ideas for this fudge! Do I need to add salt? What does it do?